The two pillars of the positive energy balance of the building are the maximization of energy production and the minimization energy consumption. More simply, what we want to do is to obtain the most possible energy from sunbeams and keep it as best as we can. 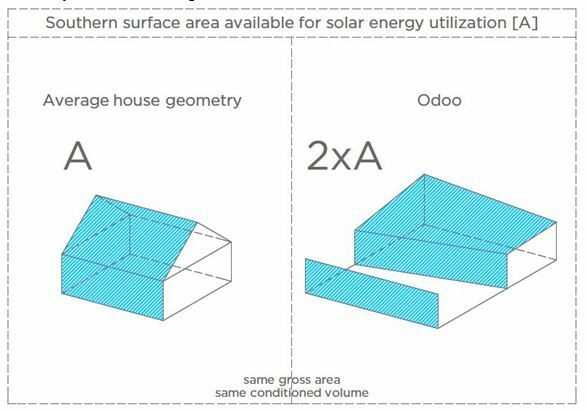 In the case of Odoo, the energy produced actively is ensured by the power of the built-in 9k Wp solar panels, and the passive system is based on the architectural design (which we already mentioned in the previous chapter: orientation, mass, glass surfaces…) and the machine structures of the building. In this chapter we are (partially) going to present those means and measures which produce these energy profits. One of the basic concepts of Odoo is that solar panels are not only the “necessary inconvenience,” placed somewhere on the house, but, as architectural elements are organic parts of the appearance and structure of the house. The primary energy source is the monocrystalic sunshade located on top of the roof which has a 6° altitude. 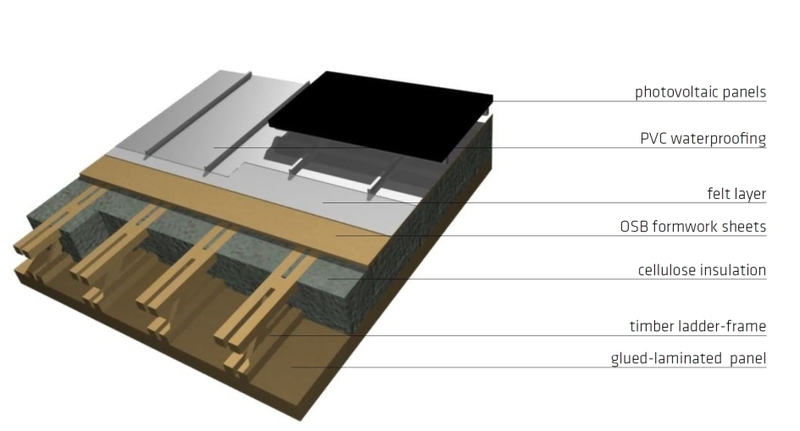 It is applied in a fashion that there would be a clearance between the solar panels and the roof structure. Thanks to that, air moves freely, so the heating of the solar panels is controllable, increasing their efficiency with 15-18%, and additionally, the air venting through cools the building too. The vertical solar panels on the summer wall work the most efficiently at winter, low-altitude sunbeams. As we talked about it in the previous chapter, we find it important to try to create a compact shape instead of a complex, fragmented building shape. With this intention, we fundamentally define the heat emission traits of our building. The heating energy requirement of a house is influenced by the ratio of the cooling surface of the house (A) and the heated space (V) (A/V ratio). 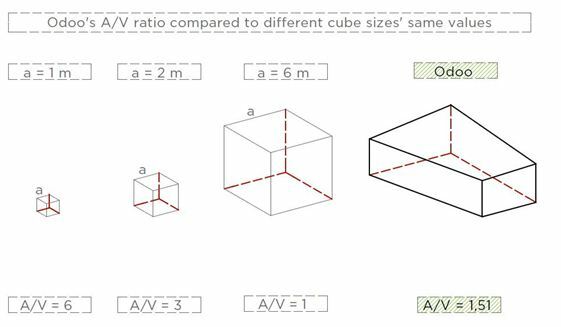 We get to most compact form with the proportionally smallest surface/space ratio, this number needs to be as small as possible – but of course it will never reach zero. The surface/space ratio of the Odoo is 1,35. We already mentioned the advantages of the doubled southern facade in the previous chapter: the south wall of the living block is made up of a series of windows, the giant glass surface (exactly 32 m2) serves to passively take in solar energy, and the vertical solar panels located in the wall on the southern side of the terrace serve as active energy producers. This means that the same space which needs to be cooled and heated has twice the size of energy producing surface as in a normal case. mass- as a thermal storage. 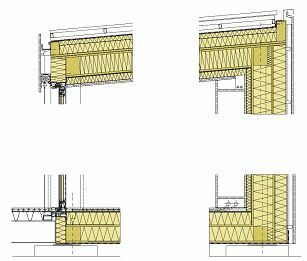 In traditional houses, this role is played by the brick, concrete or clay walls, in our case though, – because it is a lightweight construction for easy transportability – these materials are out of the question. Out of the alternative possibilities we have chosen water: we designed heat insulated water containers hidden in the summer walls and a pipe system in the house. After we assembled the building we can fill it up with water at any point of the world, and we can drip it off whenever we want, too. The water as a material is everywhere accessible and cheap (for now…) and environmentally friendly. By circulating 3,5 m3of water, we can increase the mass of the building to the required level, and we can protect it from overcooling or overheating. natural interior light. 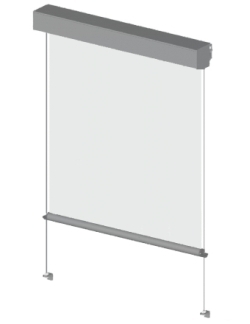 The shadings were placed on the external side as this way they function more efficiently in terms of providing protection against overheating. The shadings function with engine to be controllable, and will be connected to the central computer control. The central control also allows manual handling. The canvas can be stopped in any position, thus the finer control of the shading is possible. On the outer side of the walls we apply blown technology, cellulose insulation. 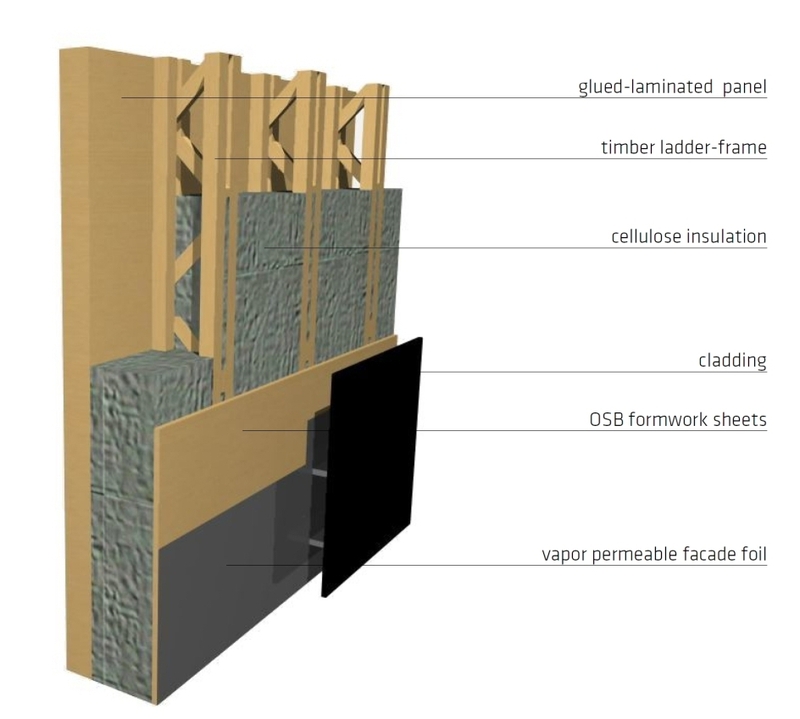 We will install ladderframe – made of wooden laths – on the supporting structure, onto OSB-3 formwork-sheet will be made, so the insulation will be placed in this gap. The building has a ventilated façade cladding. The facade is made of a large, black painted plywood-glued board, a special high-reflectance coating is made on top of the impregnated surface that reflects a wide range of the sun’s rays, making the dark wall surfaces absorb less heat. was designed to minimize losses. In total it can be told that the energy balance will be positive every month, so the energy balance will only be negative if it is a heavily cloudy day. Throughout the year, the house’s solar module system produces 2.2 times more electricity, compared to its consumption, so if storage would be managed, Odoo could supply itself all the time.